Holiday Inn Express Oakdale, located in the gold country, near Yosemite National Park, offers impressive features and services for both business travelers and vacationers. 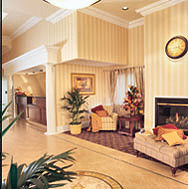 Our amenities include Jacuzzi rooms, free high-speed internet access, meeting room, pool, fitness center and more. In the heart of downtown Oakdale, the distinctive Holiday Inn Express Oakdale is located on the gateway (Highway 108/120) to Yosemite National Park and a scenic hour's drive to this national treasure! We embrace you with friendly service, modern convenience, and state-of-the art offerings. Value-added amenities and a courteous, attentive staff make this distinctive hotel the perfect destination for business and pleasure right in the heart of the beautiful Gold Country.